Remember that weird horse picture I blogged about here, here, here, and here? Two articles appeared today—one in Sheboygan, the other in Fort Worth, Texas—claiming that the mystery has been solved. Arthur Perry of Elkhart Lake, Wisconsin, believes that the man on the horse is Frank L. Roenitz of the C.T. Roenitz Leather Company. "Maybe he wanted to lay a claim to that animal for the hide," Perry said. A picture of Frank Roenitz, found in the Illustrated Atlas of Sheboygan County published in 1902, shows a man who could possibly be the mysterious man in the picture. Jim Hodges of Glen Rose, Texas, though, has a different theory. "That horse isn't dead," said Hodges, a 70-year-old horseman. 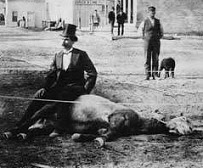 "Jesse Beery is the man in the photo, and he would lay a horse down like that and usually he would have an accomplice walk around the horse beating on a pan or something to show that the horse wouldn't move." Hodges said that it was 50 years ago, or more, when he became familiar with Beery. "He used to advertise in all the old horse magazines and farm magazines. You could buy some of his training pamphlets. I bought them and there were a number of photos just like the one in the paper. He was doing the same thing, always in a top hat and black suit." Last horseman of the apocalypse? If so, he should have ridden a bicycle.